I’ve just been thinking how much I rely on technology these days. Probably more so than I first thought. In fact, just thinking about it gets me wired up. As I traipsed upstairs at stupid o’ clock the other night, way too tired as usual, I realised that my entire bedroom is surrounded by my gadgets (or toys as some would insist). When I go to bed, my Blackberry Bold sits on its charging cradle next to my bed showing the time (retro digital display of course), alongside the baby monitor, baby video monitor, TV and Sky remote, DECT phone and laptop. The DAB radio sits on my husband’s side with his kindle and Blackberry. Some nights there’s a tablet sitting there as well. On the wall is a way-to-big-for-the-bedroom Samsung TV. 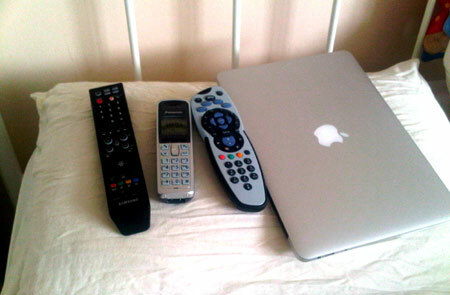 I’m not sure how exactly I find the time to use any of these between getting upstairs and collapsing into slumberland. I’m woken by the Blackberry alarm most mornings, or the DAB radio and more often than not, the little monster has tiptoed in at some ungodly hour and wants the TV on to satisfy her Mickey Mouse or Peppa Pig obsession. The first thing I do is check my email on my phone, then twitter and then facebook. The bathroom is in itself its own little gadget wonderland, with a shower (and pump for a power shower) complete with water jets, electric shaver for the hubby and electric toothbrushes. All that before I even get downstairs to the kitchen. But that’s another post for another gadget-laden day in my life. This entry was posted in gadget, General, techie gadgets and tagged baby monitor, blackberry, computer, gadgets, laptop, technology, TV. Bookmark the permalink.